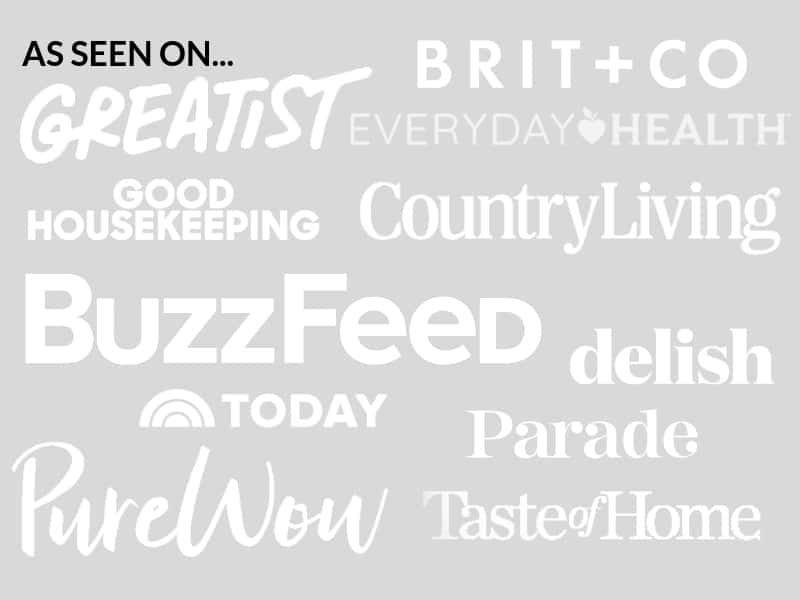 November 29, 2018 By Elizabeth Lindemann 4 Comments / This post may contain affiliate links. 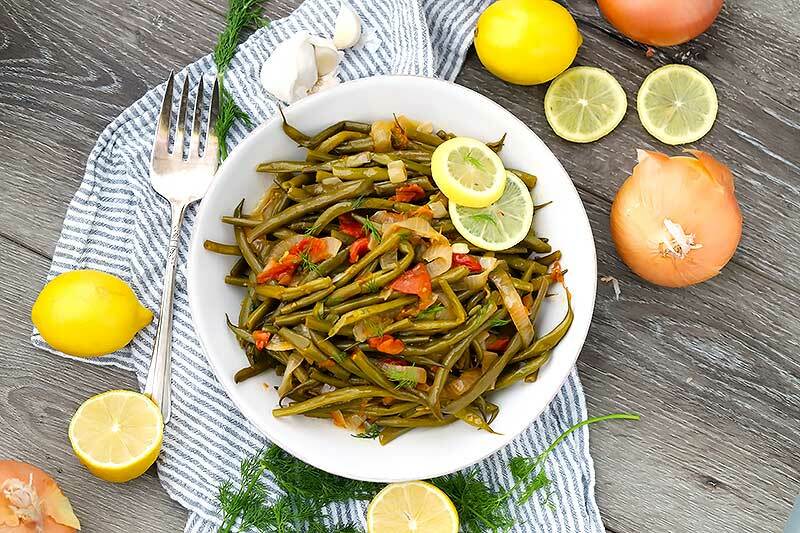 Greek Green Beans (Fasolakia) are one of the most simple yet wonderful Mediterranean recipes in existence. 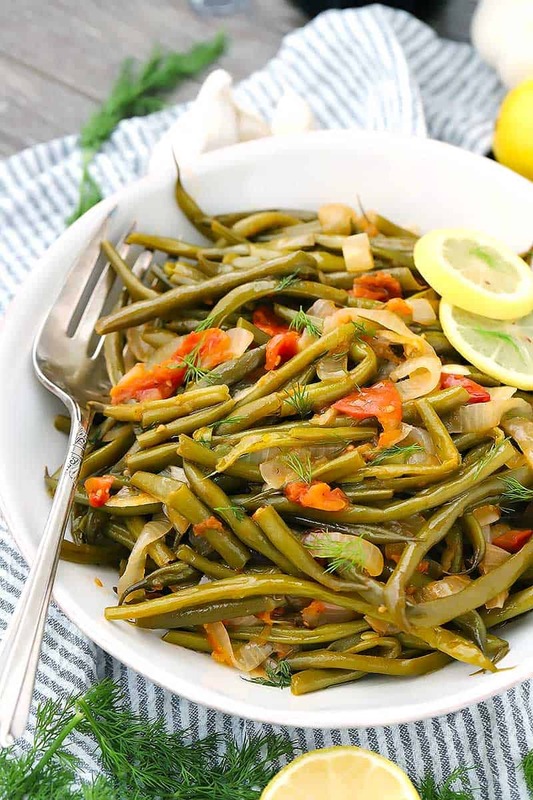 The beans cook up velvety tender in a tomato and garlic based sauce, and are tossed with fresh lemon juice, dill, and plenty of extra-virgin olive oil just before serving. 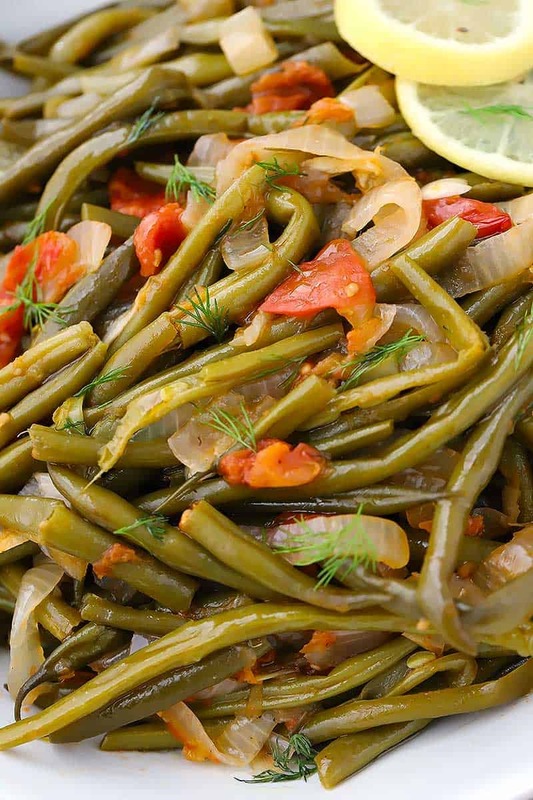 Greek-style green beans really seem much more like a “stew” to me. The liquid in which it cooks turns into a wonderful tomato-based broth flavored with onions and garlic, infused with the vegetal flavor from the green beans as it cooks. Fresh lemon juice, fresh dill, and extra-virgin olive oil added after cooking at the very end give it a bright flavor, and the oil adds body to the broth. They’re great as a side, but I’d be happy with this as a meal served over rice or with crusty bread to mop up that delicious sauce! Throw a couple of thick pieces of feta cheese on there and you’re good to go for a simple vegetarian meal. The other awesome thing about this is that it reheats really well, so it can easily be made in advance. I’ve served this at the past two Thanksgivings, and each time I cook it the day before. If you make it in advance, make sure to add the lemon juice, dill, and olive oil just before serving after you’ve reheated it (on the stovetop or in the microwave is fine!). These ingredients taste best when fresh (and there’s some thought that extra-virgin olive oil is healthier when it isn’t heated up). These are GREAT on the side of roast chicken or sea bass. I used fresh tomatoes for this, but you can use canned if you want. In fact, unless you have really good ripe fresh tomatoes, I’d recommend using canned. It’s one of the few ingredients that often is better than fresh since good fresh tomatoes are hard to come by, especially out of season. There are a few other recipes like this that add potatoes to the mix, which is delicious, since they soak up a lot of the yummy liquid. If you want to do this, just add some diced potatoes (about 2 cups), and add more water and salt to the mix. You can also make this in your slow cooker if you want! Just add all the ingredients except for the lemon juice, dill, and olive oil to the crockpot and cook on high for three hours or low for six. Stir in the lemon juice, dill, and olive oil after it’s done. One last thing- you can use frozen green beans if you want. No need to defrost- just throw them right in as you would with fresh! 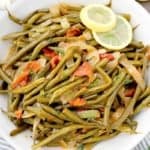 If you like these Greek Green Beans, you’ll love this recipe for Slow Cooker Greek-Style Green Beans and Chicken Thighs, these Southern Style Green Beans, and these Sautéed Green Beans with Blue Cheese and Walnuts. 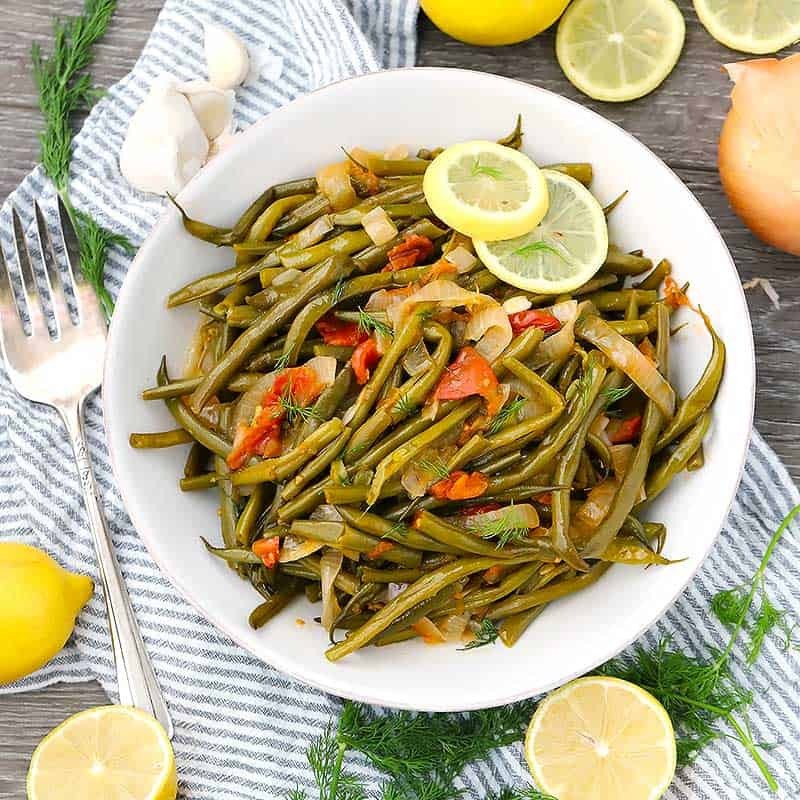 These Greek Green Beans (Fasolakia) are velvety tender, served in a tomato and garlic based sauce with lemon, dill, and plenty of extra-virgin olive oil. 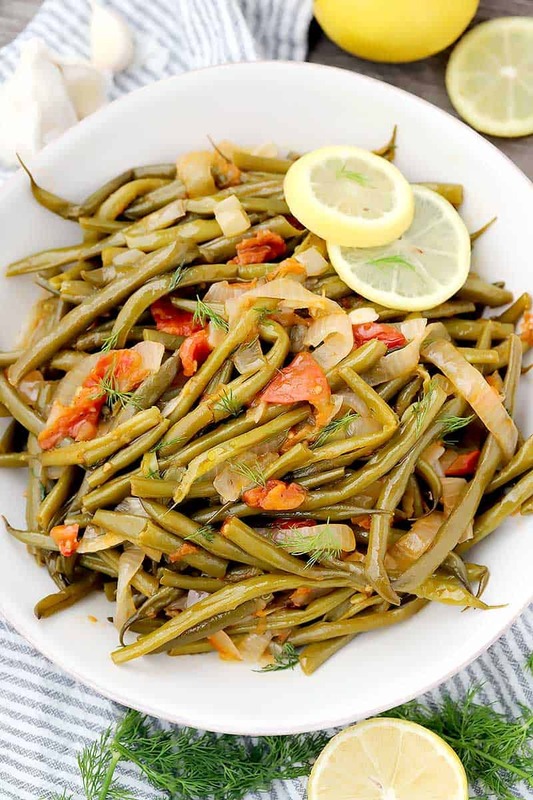 It's a perfect Mediterranean, low carb, paleo, and vegan side dish. Heat 1 tablespoon of olive oil in a large pot or dutch oven. Sauté the onion over medium-high heat until softened and starting to brown (about 5 minutes). Add the garlic and sauté until fragrant (about 30 seconds). Add the tomatoes and stir together. Continue to cook until they start to soften and break down (about 2 minutes). Add the green beans, water, salt, and pepper. Stir just a bit to distribute the ingredients. Turn the heat to low, cover, and simmer for 30-45 minutes, or until green beans are tender to your liking. Stir occasionally to make sure the beans get equal times on the bottom and top of the pot. Remove from heat and stir in lemon juice, fresh dill, and remaining 3 tablespoons extra-virgin olive oil. Season to taste and serve hot. A 15-oz. can of diced tomatoes can be used instead of fresh. Just add the whole can when you would normally add the fresh tomatoes. To make this in your slow cooker, add all ingredients except for lemon juice, dill, and olive oil to the crockpot and cook on high for three hours or low for six. Add the lemon juice, dill, and olive oil after it's done just before serving. For a heartier meal, try adding some diced potatoes with a little more water and salt when you add the green beans. 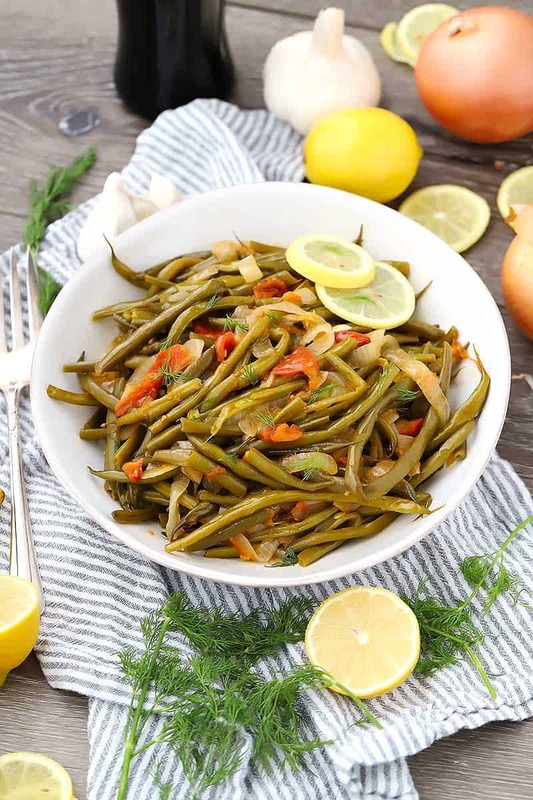 Or, serve these green beans (and the juices) over rice or with crusty bread. This recipe is easy to make ahead of time, and it can be store in your refrigerator for up to three days and reheated to serve. Make sure to add the lemon juice, dill, and olive oil just before serving, as they taste better when they're fresh (but don't worry about this with leftovers!). I usually make it more like a stew with more sauce which is delicious! I add a couple of potatoes in too. Yum! Yummm I love it with potatoes too! Fasolakia is one of those dishes that seems to make its way onto the dinner table fairly often, especially when green beans and tomatoes are in season. When I don’t have lemons on hand, I do omit it from the recipe, but it isn’t the same. This dish is absolutely delicious when finished off with some crumbled feta cheese! Loveeee it with some feta cheese and crusty bread to mop up the sauce! You could use red wine vinegar in place of the lemon too (but still not as good as fresh lemon juice)!